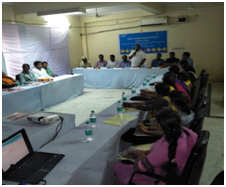 A Project Inception Meeting onEnhancing Financial Protection of Consumers in Particular Women through Financial Literacy Initiatives, supported under Consumer Welfare Fund, Department of Consumer Affairs. 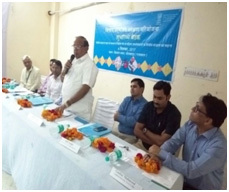 Ministry of Consumer Affairs, Food and Public Distribution, Government of India was held on 06 September, 2017 at KisanBhawan, Bhilwara Rajasthan. Total 46 persons were participated including 25 women. The Project launch meeting started with welcome speech of GauharMahmood, Assistant Director and Head, He spokeon overview of the project that it is found that poor and vulnerable community particularly rural women are unable to come out of poverty due to poor saving and investment habits. The women are more vulnerable compared to their male counterparts, because they are less control of finances but although women have important contribution in adding family income and livelihood activities. But in decision making their role is very limited that’s why women have not much access to the financial service, He said the project duration will be Two years started from 19 May 2017 to 18 May 2019, will be covered all 23 block of Chittorgarh and Bhilwara, He explained the goals and objectives, proposed activities would be Base line research, identification of consumer groups, Annual and Final Stakeholder’s Consultation and Dissemination Meeting at each District. Second round training in all blocks, final stakeholders’ consultation, project dissemination and advocacy meeting will be the part of the project. Inaugural Address by Mr.KaluLalGurjar, MukhyaSachetak Government of Rajasthan spoke that women should come forward to get financial information, training and education. He told that the women which are belong from rural area, they are not aware and familiar with banking and financial institution. Our Prime minister of India NarendraModi started Zero balance account scheme for poor people of India, But due to lack of awareness about financial inclusion. People are not operating their account well. So through the CUTS programme, we can achieve and full fill their need and demand about banking services. It is our moral duty to link these women to these financial services and products. Mr. Munish P Kothari greeted the dignitaries and he explained about the Reserve Bank of India and He shared the facts of banking sector and financial literacy/inclusion and challenges faced by financial consumers and said this project will build the capacities of rural consumers in term of financial literacy their by enhancing awareness, knowledge and skills among the target community on the financial related. He said RBI gives you rupees 1 lakh security. Banking system has changed completely over the past few years. Now the Banks work has become completely digital. Pass-book, Cash withdrawal everything completely digital. But you have need to financially literate. The government also that recently we have discussed on the status of women that they are in good position, while the reality is something else. Men violate women’s financial rights. Women should have their own right to spend their money, and then they will be empowerment. Women should open their account by the Jan-Dhanyojna. He gave many of various information about related banking facilities.It is your right to complain. You can complain to the banking ombudsman by correspondence or email. 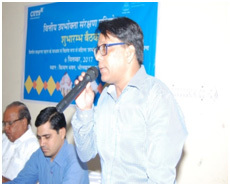 Mr. OmprakashSaini, Deputy Director, ICDS-Bhilwara delivered message that this program is very appraise and valuable for those people, who has disconnect with bank, many women they are living in hamlets. They will get benefits like this activities, MrSaini thanked to CUTS team for organised like this meeting. He told that his department will help to cluster level activities in this project. He told that CUTS is working in Bhilwara to last manyyear. CUTS team work is good and we hope that they will achieve objective of project with successfully outcomes. 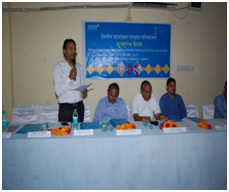 MadanGiriGoswami, Senior Programme Officer was the convener of the event and also said based on the outcome of baseline, consumers would be identified into Financial Literacy Groups in clusters. These groups would then be provided training with the support of expert trainers and would be involved in networking with various banks, financial institutions and governmentdepartments with sustainability point of view. RadheVaishnav expressed gratitude to all the participants and the program concludes. Vaishnav told that we will formed 4 Cluster in each block and will be organise Cluster level activities. He has given thanks to all dignitaries, women, media and CHD team.